Gush Shalom grieves and mourns the passing of its founder, Uri Avnery. Until the last moment he continued on the way he had traveled all his life. On Saturday, two weeks ago, he collapsed in his home when he was about to leave for the Rabin Square and attend a demonstration against the "Nation State Law", a few hours after he wrote a sharp article against that law. 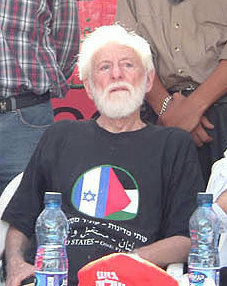 Avnery devoted himself entirely to the struggle to achieve peace between the state of Israel and the Palestinian people in their independent state, as well as between Israel and the Arab and Muslim World. He did not get to the end of the road, did not live to see peace come about. We – the members of Gush Shalom as well as very many other people who were directly and indirectly influenced by him - will continue his mission and honor his memory. 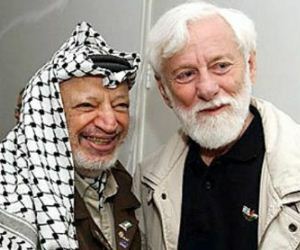 On the day of the passing of Uri Avnery, the most right wing government in the history of Israel is engaged in negotiations with Hamas. Ironically, the same kind of demagogic accusations which were hurled at Uri Avnery throughout his life are now made against Defense Minister Avigdor Lieberman. In the history of the State of Israel, Uri Avnery will be inscribed as a far-seeing visionary who pointed to a way which others failed to see. It is the fate and future of the State of Israel to reach peace with its neighbors and to integrate into the geographical and political region in which it is located. Avnery's greatest opponents will ultimately have to follow in his footsteps - because the State of Israel has no other real choice.